It absolutely is a beautiful thing. Thank you for the reminder! May god bless her! Nice write up. My friend is celebrating her time now free of an agressive cancer, it was hell YES all the way and I am still so impressed by her attitude throughout and beyond. Very powerful post! We both selected the word Yes for Y but handled it in very different ways I appreciate your comment on my blog about being a Yes Woman. 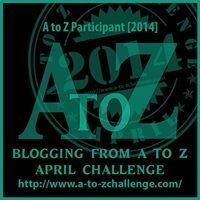 I have really learned a lot from visiting your blog during the A to Z challenge and will continue to return. I too have a very ill friend and she never ceases to amaze me with the beauty that comes from within, shining through and overpowering her illness. I wish you and your friend well. Thanks, I like your post as well. Do visit again and let me know when you do (I am thrilled and humbled that you learned something). Continue to be the Yes woman who gets the “no” side of things. Will visit you again too. Love this A to Z connection thing! Thank you! I have followed your posts so I will definitely be back. I love the A to Z connection too. I had no idea how many good bloggers were out there, including you. I had the same experience, and right back you Stephanie. I have long known the power of positivity. Sometimes it can be hard to hang onto. Given the hectic week we just had in this house, this reminder is quite timely. Thank you. It’s a reminder for me too!